Join us this summer as we "reconstruct the past” and save an iconic lookout on the Colville NF! 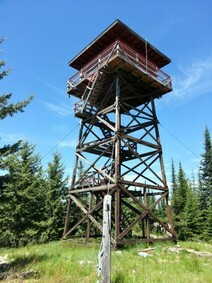 The Timber Mountain Lookout was built in 1959 for fire detection on the Colville. It saw its last formal use as a fire lookout in the mid-1970s and, although disused, still functions, intermittently, as originally intended when thunderstorms come through the region. This lookout commands an impressive view of the Pend Oreille Valley and the Selkirk Mountains, home to diverse and abundant wildlife such as grizzly bear, moose and wolves and the surrounding area is a popular area for fishing, hunting, wildlife viewing, canoeing and OHV riding. Although neglected for a number of years, there is a strong desire on the part of locals and the Forest Service to preserve this old structure and to make it available to the public. Therefore, this year with your help, we will help to put this building and its commanding views back to use. PIT volunteers and FS staff will repair and paint this structure until it shines like new. It will be sweaty and dirty work, but a lot of fun (especially if you like heights! ), and you will be able to say that you helped breathe life back into this iconic structure. We hope you will join us in August!